All the best discernment articles, books, videos and audios! This DVD is a message based on this article. This article is about the use of invective while attempting to do apologetics or teaching discernment. Invective is defined as a noun: insulting, abusive, or highly critical language ie. "he let out a stream of invective". I admit to using invective at times in the past. My goal is to stop that practice and focus on the facts, not attack an individual’s ability to comprehend. In the case of Christians, the first thing to consider when doing apologetics is our mandate to reconcile people to Christ, no matter who they are. 2 Cor. 5:18-21 Now all these things are from God, who reconciled us to Himself through Christ and gave us the ministry of reconciliation, namely, that God was in Christ reconciling the world to Himself, not counting their trespasses against them, and He has committed to us the word of reconciliation. Therefore, we are ambassadors for Christ, as though God were making an appeal through us; we beg you on behalf of Christ, be reconciled to God. He made Him who knew no sin to be sin on our behalf so that we might become the righteousness of God in Him. Only $10. plus s/h. for US. This booklet is taken from this article! I have some questions for those of the World Christian Gathering of Indigenous People (WCGIP) adherents such as Don Richardson, Daniel Kikawa, Richard Twiss (deceased), Terry LeBlanc, Danny Lehman, Aloha KeAkua, YWAM as well as many in the Emergent Church (EC) ... the questions arise from their claim that the "supreme beings" of the nations are all the True God, YHWH, the God of Abraham, Isaac and Jacob. You can read more on this subject in our book "Idolatry In Their Hearts" or in the WCGIP section of my site. My main question for them is this: When did ANY of the Patriarchs and Prophets in the Old Testament and the Apostles or Jesus Christ in the New Testament EVER claim that the "supreme beings" of the nations were Elohim/YHWH, the one True God? Let's look at some examples in the form of questions and you can check out the source links as well. 10 Questions is available is now available in booklet format. You can order here or at Lighthouse Trails here. $1.95 per copy, bulk orders get a discount. There has been so much hype of "revival" in our modern day that it is easy to forget the true biblical criteria and definition of revival. Revival cannot be brought about by signs and wonders or "laying" on of hands to transfer apostolic or prophetic "anointings". In fact there is no such thing in the Bible.The Biblical criterion for revival has, as a precondition, repentance. The word "refreshing" is also defined as "revive". Back to his old tricks! I received a letter from Peter Popoff. This infamous televangelist, in the past, was found to be guilty of wearing an earpiece so that his accomplices in his sound booth could feed him personal information on people in his audience while he was claiming to get personal messages directly from God. This letter proves that, not only is he back as a regular on TV, he is also back to his old tricks. The Bible is quite clear about occult practices.Neither Israel nor the Church is to have anything to do with the way the world tries to gain secret knowledge.The Gnostics were and are known for promoting new revelation that is either loosely tied to Scripture taken out ofcontext or not at all.The Israelites seeking information from the dead or in omens were judged harshly by the Lord who had warned them numerous times to stay away from that stuff. Yet due to the influences of heretical teachers in the New Apostolic Reformation, Word of Faith, Emergent Church, and the New Age many have been successful in getting lots of churches and denominations into occult practices that have been thinly disguised as “Christian�?.Many of those who follow these people, I’m sure, have no idea how far they have strayed into the occult. First I want to give the dictionary definitions and then Biblical warnings against these practices.Then I will give examples in the churches taken mainly from the ElijahList e-newsletter. Deuteronomy 18:9-12 “When you enter the land which the Lord your God gives you, you shall not learn to imitate the detestable things of those nations. There shall not be found among you anyone who makes his son or his daughter pass through the fire, one who uses divination, one who practices witchcraft, or one who interprets omens, or a sorcerer, or one who casts a spell, or a medium, or a spiritist, or one who calls up the dead. For whoever does these things is detestable to the Lord; and because of these detestable things the Lord your God will drive them out before you. Isaiah 8:19When they say to you, “Consult the mediums and the spiritists who whisper and mutter,�? should not a peopleconsult their God?Should theyconsultthe dead on behalf of the living? Using the above list from Deuteronomy and Isaiah, let’s take a look at each individual practice. The title and cover art of this work are a play off of the book by C. Peter Wagner entitled “"Dominion! How Kingdom Action Can Change The World". In contrast to this specious claim we have titled this book “Dominionism! How Unbiblical Action Can Change The Churches�?. We think that is far more in keeping with what we will present in this series of articles and essays on the subject of Kingdom Now/Dominionism. Indeed, many churches have already been changed by accepting the false teachings that constitute Dominionism. This started decades ago under Reformed Reconstrucionism and Latter Rain theology, but even before that in the Roman Catholic Church (RCC). The attempt of Constantine to protect Christians from being persecuted, since he claimed he had become one of them, turned out to begin a journey in syncretism and Dominion. It wasn’t long before corrupt church officials began to try to seize power all over Europe and beyond as the “Holy Roman Empire�?. The Reformation itself was a reaction to the lengths to which the RCC had gone to take control over the Scriptures, the nations, the kingdoms, and the people for financial gain. They sold indulgences, promising those who came up with enough money a much shorter time in Purgatory. Those same ploys are being used today on what has been loosely called “Christian television�? by the sale of trinkets and promises of healing, financial gain and even salvation. These ideas all coalesce in Dominionism. If it were true that the Church needs to take over the planet, then we would be seeing the unstoppable plans of God’s physical Kingdom unfolding. But we do not. All we see are failed prophecies, empty edicts and declarations coming from false apostles and false prophets. They love to fool Christians with talk of the “kingdom�? when it is clear they are talking about a different “kingdom�? ; a Kingdom Now not a Kingdom come. Jesus taught us to pray: “Thy Kingdom come, Thy will be done on earth as it is in heaven�?. The implication is that we are to be about building His spiritual Kingdom while praying for and expecting His physical Kingdom to come. The only way we can do that is to continue in the Great Commission till He comes, not attempt to rule where God has not given the Church the authority to rule. Jesus will do that when He returns. If we go off on the tangent the Dominionists want us to go, we will not only miss out on the blessings of His Kingdom to come, but may well be deserving of judgment. Bad seeds from a bad tree yield bad fruit. Matt. 13:38-39 The field is the world, and the good seed stands for the sons of the kingdom. The weeds are the sons of the evil one, and the enemy who sows them is the devil. The harvest is the end of the age, and the harvesters are angels. Matthew 7:17 Likewise every good tree bears good fruit, but a bad tree bears bad fruit. Original sin is the bad seed in everyone. We all start with a bad seed. Jer. 17:9 The heart is deceitful above all things and beyond cure. Who can understand it? We need to have the bad seed destroyed and replaced with good seed. Gal. 5:24 Those who belong to Christ Jesus have crucified the sinful nature with its passions and desires. 1 Pet. 1:23 For you have been born again, not of perishable seed, but of imperishable, through the living and enduring word of God. The good seed is the Word, the Gospel. Luke 8:11 "This is the meaning of the parable: The seed is the word of God. 1 John 3:9 No one who is born of God will continue to sin, because God's seed remains in him; he cannot go on sinning, because he has been born of God. Bad seeds are from the enemy and are full of false doctrine and a false gospel. Will the Real Blasphemers Please Stand Up? This subject is one so serious that I do it with great fear and trepidation. Nonetheless, because I get so many e-mails accusing me and other Bereans of blasphemy, among other serious charges, I felt it was necessary to clear up some issues on this topic. Because of my stand for the truth of God's Word juxtaposed against all the false teaching that is going on today, I think it is important to do a quick study on what blasphemy is actually all about from a biblical standpoint. There are many references to blasphemy in the Bible and from them we can find out how and why that term was used. You will see that the word "blasphemy" in the Scriptures is the very definition of what the false teachers and false prophets are doing today! This is a name I came up with for people attending and teaching at Oral Roberts University in the 70s. Even back then I had come to realize that their way of representing Christianity was not in line with the Scriptures. At that time I didn’t know that Oral Roberts was carrying on the Word of Faith traditions of New Thought practitioners such as Kenneth Hagin, Kenneth Copeland, Essex Kenyan, Norman Vincent Peale, Robert Schuler, and many other false teachers of the time. Though I didn’t know anything about Word of Faith or New Thought then I knew that the way they were representing Christianity was just not right somehow. Their desire to portray Christians as rich, beautiful, healthy, perfect, and virtually sinless (holiness) went directly against the example of Jesus, the Apostles and the early church. The articles below are now also available on MP3 CD or MP3 DVD! (1) "They Will Believe The Lie"
(13) "... and all liars"
(16) Is It Possible To Believe In Jesus ... And NOT Be Saved? The book by C.S. Lewis called "Screwtape Letters" was a clever idea in exposing a number of tactics of the enemy. Those principles are still at work today in many churches. Following is a list of some of the things the enemy wants to see in churches and Christians in order to bring them down. I was driving along and noticing that spring has sprung here in North Carolina. One of the first trees to bloom is the Bradford Pear. I began to notice how that tree has proliferated almost everywhere and then my wife looked up the information on this tree on the web. As she began to read the facts about this tree and its proliferation I began to see an allegorical parallel to what is going on in much of Christendom. But before I get into what the Bradford Pear can show us about the churches, I need to present the facts about the tree. Matt. 6:9-13 This, then, is how you should pray: "Our Father in heaven, hallowed be your name, your kingdom come, your will be done on earth as it is in heaven. Give us today our daily bread. Forgive us our debts, as we also have forgiven our debtors. And lead us not into temptation, but deliver us from the evil one." This model prayer that Jesus taught the disciples to pray contains many important precepts. It should probably be called "The Disciple's Prayer". It starts with a very important concept in the first verse. The new Universalists are not as vocal about their Universalism ideas but are far more deadly to the Church as they are not rejected like classic Universalists were decades ago. The new Universalists would include Emerging Church leaders like Brian McLaren, Leonard Sweet, Spencer Burke, Alan Jones and others like Wycliffe, Society of Biblical Literature, World Christian Gathering of Indigenous Peoples, Richard Twiss, Daniel Kikawa, Terry LeBlanc, Rick Warren, Henry Nowen, YWAM, Tony Campolo, Robert Schuller, George Otis Jr., and even Billy Graham. I admit that I am very skeptical about the future of discernment and apologetics ministries. I don't see the next generation coming up to replace those who have stood for the truth for so long. Fortunately many apologists have gone to be with the Lord but who will replace them? I don't see replacements coming up who will take the place of those who have been fighting the fight the years. I run a web site where I collect articles and materials from all over the world and present them in a sort of Reader's Digest format so that people can come to one place to get the latest information on heresies in the churches as well as research past ones. What I've seen in the last couple of years is that the production of regular materials is declining to the point where it's becoming difficult to find one article for my site to post every day. Of course I write my own articles but don't have enough time to write an article on a daily basis. I am very concerned because of the tsunami of false ideas from the enemy in the churches. At the same time, unfortunately, I see a lot of younger people who don't even recognize anymore that something is wrong. You can also view this DVD online here. This 4-DVD set is a combination of a condensed study on Church History and the Discernment Toolkit series which deals with the core doctrines of the Church and how to use them to discern error. The Church History DVD takes a different approach to Church History in that it does not celebrate the Catholic Church but rather exposes it as false Christianity. It covers World religions, false Christianity and finally a study of the true remnant Church through history following the story of the many martyrs who stood up for true Biblical faith. This is both an incredible source of hope for Christians who are downtrodden, and a source of escalating heresy in many churches.It is critical that we understand what Paul was talking about when he wrote the phrase “weight of glory�?.Jacob Prasch has repeated this phrase in his teachings over the years … “A text, out of context, in isolation from co-text is always a pre-text. "A huge problem today is that individuals and movements tend to yank verses out of their context and build a cult of heresy around them.This is called eisegesis or plugging your own ideas into the Scriptures instead of exegesis, gaining understanding and interpretation of the Bible by studying it in context and in the scope of the whole written Word. Did God Put "Eternity In Their Hearts"
or "The World In Their Hearts"? In the introduction to Mike Oppenheimer's and my book "Idolatry In Thier Hearts" I exposed the fact that Don Richardson pulled the phrase "Eternity In Thier Hearts" to use as his book title from it's context in Ecc. 3:11. He did this to support his thesis, which actually contradicts the second part of that verse, where it states that man cannot fathom what God has done. Richardson, rather, sets forth what has become the foundation for the false teachings of the WCGIP, YWAM, a number of Bible translation societies and the Emerging Church ... the propostion that men from Gentile cultures have always been seeking God and that Gentile cultures were already worshipping the true God before missionaries came with the Gospel. But as I further investigated this verse I found that Richardson even ignored the true meaning of the FIRST half of the verse in favor of a few translations that use the phrase "eternity in their hearts". Jeremiah 3:10-11 And yet for all this her treacherous sister Judah hath not turned unto me with her whole heart, but feignedly, saith the LORD. And the LORD said unto me, “The backsliding Israel hath justified herself more than treacherous Judah.�? (KJV) Israel had turned away from the Lord and had gone after the gods of Canaan, namely Baal and Asherah. Because Israel had prostituted herself with false gods in worshipping the polytheistic gods that started at Babel, God had declared He was divorcing Israel and would send them into exile until they again returned to the true God. But Judah prided itself in doing what God had commended as they had Jerusalem and the Temple. They disdained Israel for setting up altars to Baal and Asherah poles on high hills. Yet God was not fooled by Judah’s pretence. In the KJV it says they were not worshipping God with their whole heart but “feignedly�?. 2 Cor. 2:17 Unlike so many, we do not peddle the word of God for profit. On the contrary, in Christ we speak before God with sincerity, as those sent from God. There are many false teachers on TV these days who peddle the word of God for profit. They make promises of healing that do not come true by claiming if they are given a financial gift the person will receive healing and riches. When what they promised does not happen the person is blamed that they did not have enough faith. This often destroys the faith of people who fall into the traps of these snake oil salesmen. I have no problem with people charging for their materials if they cost to be produced, even though it is hoped that when a person cannot afford to pay for books and DVDs they will receive them free of charge. But the charges levied on people for conferences and speaking engagements is often excessive. A minister of God can ask for support and deserves it if they are being diligent in their study and proclamation of the Word. But experiences and feelings often come with a price today and that is not right. Today we often hear the word "mistake" coming from pulpits, and especially in defense of false teaching and false prophesy. "Cut him some slack! He just made some mistakes". "We all make mistakes, so don't judge lest you be judged." We even hear the word "mistakes" being substituted for the word "sin" in many presentations of what I have termed "Gospel Lite" today. So is it proper to substitute the word "mistake" for the word "sin"? We'll look at the problem of one word "mistakenly" being used for the other. This 3-DVD set is a message based on this movie review. I am sorry to say this but Bethel is clearly a cult of Christianity holding to most of the teachings of the Latter Rain and Word of Faith. They have demonstrated repeatedly a manipulative atmosphere targeting young people in particular while preaching rank heresy. This new film is a continuation of those false teachings and practices. I pray for the young people in that church that they will come to know Jesus Christ as their Savior and thus come to know the true Holy Spirit. This 3-DVD set is only $30. plus s/h. for US. This "Holy Ghost IGNORED! Part 4 - Addendum is part of a 3-DVD series by Sandy Simpson reviewing the film "Holy Ghost Reborn". This addendum features a number of false teachings of Bethel Church in Redding, CA that I was not able to include in the 3-Part series. Get the whole thing! It is very important to see what has become the "new" Christianity. The world system has always been a "top down" structure, starting at the apex of the pyramid and going down to the bottom. In kingdoms we have the king at the top, then the princes, common people, slaves. In a democracy we have the President at the top, the VP, the Sec. of State on down to the citizens. In business we have the CEO at the top, upper management, lower management, office workers and the janitors. Unfortunately, sometime in the third century, the church started to have a top down structure. This is also when the church began to be in error. The church of Rome began to have a "top down" structure that started with the pope, then cardinals, then bishops, then priests, then the people. Well, what about that? Eph 4:11 It was he who gave some to be apostles, some to be prophets, some to be evangelists, and some to be pastors and teachers, This all sounds like a "top down" structure. But the problem is that people have not seen an important fact about these gifts of the Spirit -- man looks at function and title, God looks at aim and goal! Read on. Eph. 4:12 to prepare God's people for works of service, so that the body of Christ may be built up. These are not gifts given for title or to give people job descriptions. They are given because there are people out there who need our help! The church needed the Apostles. They were the ones who were the foundation of the church. They were the ones who saw Jesus in the flesh and were taught by Him personally. They wrote the New Testament Scriptures. Though the gifts of apostle and prophet are different today than in biblical times, the gift of evangelism, pastoring, teaching and others are still the same. A person who is an evangelist does not just have a title so he can rule over people. The reason that he has the gift to be an evangelist is so that he can tell others the good news. Why do we have pastors? Are they supposed to rule the church and get everyone to support them and bow to their demands? No. They are to serve the church by helping people to come to a fuller knowledge of Jesus Christ, to equip the saints to become more like Jesus every day. The true structure of Christianity is symbolized as an inverted pyramid! In my article �Blasphemizing the Bible� I give a number of examples of how a lot of modern Bible translation societies are putting the names of �supreme beings� in the Bible in the place of God or YHWH. In this article I'm going to examine two of the excuses they make for making those substitutions in the Bible in many hundreds of different languages today. (1) They claim that God has many different names and therefore they think they are justified in putting the names of various gods of various cultures in Bibles, as long as they are considered �supreme beings�. (2) The second excuse they give is that the names of the �gods� they are placing in the Bible are generic terms for God, like the words �God�, �Theos�, �Dios� and �Elohim�. By generic I mean a word that can be used for any deity whether of the one true God or other false gods who claim to be God. I will go through both of these excuses and show that they are both unbiblical, therefore the Bibles they have translated with names of other gods in them, or names they claim are generic, prove that they have �blasphemized� those Bibles. There has been a concerted effort by the false teachers from many movements inside the church such as Word of Faith, New Apostolic Reformation (NAR)/Latter Rain, World Gathering on Indigenous People and Emerging Church among others to diaprax people into thinking that the church has been ineffective until they came along with their new and improved ideas on how to take over the world. This is always a feature of the Hegelian Dialectical process put into action by praxis, thus diaprax. In order to form a new paradigm or worldview the leadership of these movements must vilify orthodox Biblical Christianity. Go here for product information. There are so many "Christian" leaders out there that teach delusional teachings. These teaching are dangerous and can lead a person to shipwreck their faith. A good subtitle for this article might be "Practice What You Preach!" There is no doubt that God can and does heal people today. But the false doctrines of the Word-Faith Movement about "declaring" healing, "name-it-and-claim-it", etc. have been proven to be lies by the very people who sell this deceit. If you don't know about where these famous "faith healers" go when they need healing, you may be surprised. Why couldn't they heal themselves when they purported to be able to heal others by virtue of their superior faith? What happened to the extraordinary faith they claimed to have, enough faith to heal and be healed? Since they are the ones who taught that all you have to do is claim the healing that is in the Atonement (Is. 53:5) why did they not do so? Don't their deaths prove that what they were preaching was a lie and pragmatic witchcraft rather than biblical relality? It is quite clear from Scripture that YHWH does NOT consider the �supreme beings� of the nations to be Himself, the One True God. This is in opposition to the teachings of Don Richardson, Daniel Kikawa, Richard Twiss and many others promoting the World Christian Gathering of Indigenous People movement, Emergent Church and Liberal theologies. I have proven this time and time again in my articles on the subject but I am going to consolidate the information from the Bible in this article by studying the false gods named in the Bible. I am sure I will not be able to cover every instance of supreme beings mentioned in the Bible but I (1) want to deal with some of the major ones (2) show you where they are found in the Word, and (3) prove that they were the �supreme beings� of those nations named by the patriarchs, prophets and Apostles and that they were not monotheistic gods but polytheistic in the tradition of Babel where the false religion of polytheism first took root through the worship of Nimrod and Semiramis. You need to "nip it in the bud"! I am writing this article to address a subject that I have often observed. It is the fact that if you do not get the leaven out of your church the leaven will become the leadership.The Bible teaches quite clearly that if you let the leaven in you will leaven the whole lump. Galatians 5:9 A little leaven leavens the whole lump of dough. We see this often in the case of many �Christian� movements that have allowed a small error to exist in their churches and have not dealt with those issues. It then ends up metastasizing into worse and worse problems as time goes by. Now, I bet you read the title of this article and thought I had misspelled the word "pantheism". Just so that those of you who write to me advising me of words I have misspelled in articles (and I do often) I want to tell you that I am using the term "panentheism" as coined by Karl C. F. Krause. You can read more about this word and concept in an excellent book called "A Time Of Departing" by Ray Yungen. There is a new "God" being promoted in the Third Wave, New Apostolic Reformation (NAR) and Word of Faith movements whose teachers are regularly seen on TBN, Daystar, SkyAngel, CBN and other "Christian" TV networks. Some of those teachers even have, what would be considered, a fairly typical statement of faith or doctrinal statement they endorse. But by what they teach they end up promoting a false unbiblical view of God, especially through their actions and experiences. The whole phenomenon of "slain in the spirit" and all the antics that go with it are brainwashing an entire generation of Christians to put their faith in another Jesus, another Spirit, another Gospel. This new "Jesus" and "Holy Spirit" is clearly pantheistic or panentheistic in nature. Though some of these teachers would claim to be believing in the God who is One God in Three Persons, by what they teach they deny the very revealed character of God from Scripture. This DVD is a message based on this booklet. How do you answer an invitation to attend a meeting where you know nothing about the speaker or what will be done there? What happens if they want to announce the meeting at your church and invite everyone? What do you say to a person who tells you that you don�t have the Holy Spirit even though you are a Christian? What should you do if you think something is wrong, or your conscience is bothering you about something that was said or done? The answer? The Bible has all the answers to your questions. This little booklet is an attempt to deal with a few of the typical statements you will hear from people who have become involved in the Third Wave revival movement. By �Third Wave� I am referring to teachers, �prophets� and any meeting associated with the Toronto �Blessing�, Brownsville Assemblies of God, Rodney Howard-Browne, Benny Hinn, Kenneth Copeland, Rod Parsley, Marilyn Hickey, Joyce Meyers, Bethel Church, Lakeland and many others who appear on the Trinity Broadcasting Network and the 700 Club on TV. Hopefully the statements and answers in this booklet will set you off on an investigation of your own in the Word. If you need help, and you have access to the Internet, you can visit my web site called �Deception In The Church� that deals with these issues and has the articles mentioned in this booklet. If you see what I see in this passage, this argument cannot be used for people like Benny Hinn, Kenneth Copeland and the hundreds, even thousands of Third Wave ministers today who are not merely envious and self ambitious, but are also teaching outright false doctrine. Paul was not talking about heretics in this statement, but "brothers in the Lord" who preach the Gospel with wrong motives. Third Wave teachers not only have wrong motives, they also have the wrong message. This argument cannot be used for people like Hinn, even if they manage to preach enough of the "Gospel" for people to come to a saving knowledge of the Lord, because they are also teaching and practicing heresy. Satan often disguises himself with the purpose of deceiving people. One way in which I believe he is putting on a masquerade is by appearing as �Mary� to millions of people worldwide. So much heresy is entering the churches these days. As you would suspect, sometimes it is due to a pastor attending a conference or reading a book and becoming diapraxed with unbiblical ideas. He then starts to weave those ideas into his messages and begins to invite speakers to the church who expound on those ideas. Then when confronted by someone in the church who has reservations about the new stuff being taught, they are told to not talk about it and just go along with the program. If that person does not they are ostracized, slander behind their back, and often told to leave (which is what they should do in any case). But my observation is that it is not only the pastor who causes unbiblical changes to influence a church. Often the pastor is blissfully unaware of influences coming into his church. They often come in through (1) the worship team (2) women�s groups (3) bookstore (4) children�s programs (5) interdenominational prayer efforts and (6) relief and mission organizations. If unchecked this type of infiltration is much more subtle and can become deeply rooted. Colossians 2:8 See to it that no one takes you captive through philosophy and empty deception, according to the tradition of men, according to the elementary principles of the world, rather than according to Christ. In context Paul is especially addressing, though perhaps not to the exclusion of other false religion, what had become the false religion of the Pharisees and Jewish leadership. There were many Jewish so-called �Christians� making the rounds among the fledgling early churches who were trying to get the Gentiles to come under the Law from which Christ had purchased their freedom. John Gill states this case well in his commentary. The current fad of interfaith solidarity and unity is simply a thin guise of inclusivism, Universalism and pluralism. We deal with these old heresies brought forward to modernity, these ideas that all men have have a relationship with God that will cause them to be able to avoid judgement in our book on the teachings of the World Gathering on Indigenous People movement called �Idolatry In Their Hearts�. The idea that all men who worship a �god� are worshipping the true God, YHWH, has bubbled up to the very top of our societies and religions, and even Christendoom, and should sound a warning alarm to true Biblical Christianity. Instead, as usual in our day, most Christians are asleep at the wheel while Universalists claim that you can pray to a �god� like Allah and be praying to the true Trinue God, YHWH. I also dealt with the fact that Allah is not YHWH, both in our book and in the article �Is Allah The Same As YHWH?�. What We Need Is A Reverse Paradigm Shift! I'm going to warn you now. I am going to let you in on some information tonight that is going to radically change your world view. You are likely going to experience the beginnings of a reverse paradigm shift and after tonight there will be no way to go back the way you came. You will be faced with choices that you may never have known you had. You will be faced with a new way of looking at things that is going to cause you to rethink everything that is being taught in the Emerging Latter Rain churches. It is going to be radical because the basis for this message doesn't come from Jesus Christ visiting my room last night bodily, but from His holy written Word. So buckle down your seat belts, you're likely in for a bumpy ride! I often receive requests to present updated false teachings and false prophecies by the myriad of heretics out there. We do try to keep up with all the latest. But I have to remind people that those we have exposed as false on our site have not repented of what they have already done in the past, which is why they are still on our site. So what they are doing now has no relevance as to whether or not they are now to be considered a true Biblical teacher. If and when they repent, that is renounce their false teachings and false prophecies, make restitution to those they have deceived, and begin to teach sound Biblical doctrine we will give you that information. As of now NONE of the people we have exposed have repented of their Latter Rain, Word of Faith teachings, heretical practices or their false prophecies. But in the interest of helping you to respond to a person who inquires by saying: "Those articles are old and you need newer materials" well, here is some newer stuff you can add to the pile. For you and me this really makes no difference, but for those who are living in deception perhaps it might demolish one of their arguments against the truth. Sometimes I really wonder why someone who claims to be a Bible believing pastor, for instance, refuses to listen to the truth. It frankly boggles my mind. I don't know if it is as a result of the postmodern paradigm or just that they have no love of the truth left. I don't know how that can happen in a truly regenerate person. You would think that the Holy Spirit would confirm the truth to them, first in their conscience, and finally through the written Word. But these days it is a miracle if it gets that far. I don't know if their conscience has been so seared that they don't hear the Spirit or if they just don't want to know the truth because then they would be responsible for it. I know that I cannot know their motives or the reasons why they reject truth and refuse to talk about false teaching, but I do know one thing: we are called as true believers to test the spirits. We must do this even if the result is not to our liking or befuddles us as to the reasons. Questions for Those Who Claim the "Supreme Beings"
I have some questions for those of the World Christian Gathering of Indigenous People (WCGIP) adherents such as Don Richardson, Daniel Kikawa, Richard Twiss (deceased), Terry LeBlanc, Danny Lehman, Aloha Ke Akua, YWAM as well as many in the Emergent Church (EC) ... the questions arise from their claim that the "supreme beings" of the nations are all the True God, YHWH, the God of Abraham, Isaac and Jacob. You can read more on this subject in our book "Idolatry In Their Hearts" or in the WCGIP section of my site. My main question for them is this: When did ANY of the Patriarchs and Prophets in the Old Testament and the Apostles or Jesus Christ in the New Testament EVER claim that the "supreme beings" of the nations were Elohim/YHWH, the one True God? Let's look at some examples in the form of questions and you can check out the source links as well. In running a web site with thousands of articles, 1-2 million hits per month from all over the world, and hundreds of e-mails per week, I have come to realize, with time, that there is a terrible problem in Christendom today. The problem stems from an existential subjective view of the world that has filtered into the church from secular society, but also from the teachings of heretical wolves who have taught an entire generation of churchgoers completely unbiblical methods of discernment or to get rid of any discernment altogether. Matthew 7:24 "Therefore everyone who hears these words of Mine and acts on them, may be compared to a wise man who built his house on the rock. A house built on the rock will stand. The Rock is God and in particular, Jesus Christ. Therefore His written Word is the teachings of the His Holy Spirit and a Rock we can depend on. Anyone who wants to prove anything theologically, historically, scientifically or anything else needs to start with correct information. If you start with a faulty foundation, as you build your arguments, they begin to fall apart because they are not supported in God"s truth. If you want to build on a firm foundation, you need to start the process by a careful study of God"s Word in context of the verse and according to the whole counsel of God"s Word. The Bible is the best commentary on the Bible. Given the definitions of "karma" above, this same idea, usually without the reincarnation aspect in Christian circles, has been taught for decades in New Thought movements such as the Positive Thinking/Positive Confession teachings of Norman Vincent Peale & Robert Schuller, the Word of Faith ideas of Essex Kenyan, Kenneth Hagin, Kenneth Copeland and Benny Hinn, the mixture of Eastern Mysticism and Christianity by Korean false teachers such as the "force of faith" Paul Yongii Cho, and newer renditions and fusions by people like Joel Osteen, Joseph Prince, T.D. Jakes (recently agreeing with Oprah Winfrey who teaches karma on her WHO network), and others such as Ernest Angley, John Bevere, Markus Bishop, Juanita Bynum, Morris Cerullo, Kim Clement, Paul Crouch, Creflo Dollar, Jesse Duplantis, Marilyn Hickey, Brian Houston, Rodney Howard-Browne, Larry Huch, Bishop Eddie L. Long, Clarence McClendon, Joyce Meyer, Myles Munroe, Steve Munsey, Mike Murdock, Rod Parsley, Peter Popoff, Fred Price, Oral Roberts, R.W. Shambach, Robert Schuller, Karl Strader, Robert Tilton, Paula White, Ed Young and many others. Zechariah 14:9 NIV The LORD will be king over the whole earth. On that day there will be one LORD, and his name the only name. The reason I wrote this article based on Zech 14:9 is that I was reminded of how many so-called Christians, who are influential in the churches, are promoting the worship of God in the names of other gods. So, as you can see, the root of this teaching is that Israel no longer holds the distinction of being the tree from which the Root of David (Jesus-Rev. 5:5, 22:16) came. They are no longer the "natural branches" (Israel-Rom. 11:21) on to which Gentile Christianity (the wild shoots-Rom. 11:17 or wild branches-Rom. 11:24) are grafted in (Rom. 11:17-24). According to Replacement Theology, Christianity has now become its own branch apart from Israel (the natural branch) that produced the Root and all the promises of the Bible to Israel have been taken away from them and given to the Gentile Church. This is why you hear so many false teachers taking verses out of context from the Old Testament and willy-nilly applying them to the Gentile Church. This methodology has been going on for decades in liberal churches and has been popularized by many false teachers on TV. But the fact is that Replacement Theology is utter false doctrine. It denies promises made to Israel, some of which have already been fulfilled and some which are yet to come to fruition. But when you add the fact that the Inclusivist WCGIP proponents are now saying that God planted hundreds of different trees, cultures all over the world, that are not connected to the natural branch, tree and Root, you have what can only be termed Replacement Theology on steroids! The Scriptural definition of maturity is to learn to discern truth from error so that the Christian will no longer be double minded, blown about by every wind of teaching and by the schemes of crafty people. But the problem today is that so few Christian teachers are feeding their flock's solid food. They are serving up milk and, because of that, people are starving. Yet they often don't even know they have been on a starvation diet. Amos 8:11 "The days are coming," declares the Sovereign Lord, "when I will send a famine through the land - not a famine of food or a thirst for water, but a famine of hearing the words of the Lord." Surprised by the Power of the Spirit by Jack Deer, Celebration of Discipline by Richard Foster, Purpose Driven Church by Rick Warren & Etnerity In Their Hearts by Don Richardson. These four books were widely read by Christians from virtually every denominational background before their ramifications and the movements they would spawn were known. They lay error alongside truth so were considered not to be a threat to churches. Therefore these books then became part of the consciousness of many Christians and churches, thereby laying the basis for the introduction of the modern day false teachings of the NAR, EC, CG and WCGIP that have become part of the landscape of Christendom today. With the resurgence of the old religion of Hawaii and the continual invocation of Pel� and other "deities" for years in the secular culture and even in churches with regards to worshipping 'Io, is it any wonder that those beings are beginning to manifest again? In a story called "Night Marchers" on the Kawaihae site and in a YouTube video on the same subject, eyewitnesses claim all kinds of sightings that they think are the warriors, ancestors and demi-gods of Hawaii coming back. Interestingly the first book the Hawaiian Heritage site recommends in its "Suggested Reading" list is "Perpetuated in Righteousness" by Daniel Kikawa that we reviewed in our book "Idolatry In Their Hearts" by Sandy Simpson and Mike Oppenheimer. Since Kikawa claims that 'Io is the True God and one that the Hawaiians worshipped in secret, we have to wonder if Kikawa also thinks 'Io is showing up in these night marches? Since YWAM, Aloha Ke Akua and Hilo New Hope participated in worshipping 'Io at the "edge of Hale-ma'uma'u Crater" it sounds like they have all been inviting the old "gods" to return to Hawaii. Romans 12:2 Do not conform to the pattern of this world, but be transformed by the renewing of your mind. Then you will be able to test and approve what God's will is - his good, pleasing and perfect will. The only way to renew our minds is to believe on the Lord Jesus Christ, confess our sins, and be saved, then to study the written Word and allow the indwelling Holy Spirit to teach us. Our minds are corrupted by virtue of the sin nature and what we have learned in life because our filters are off. I gave an illustration of straining coconut to make coconut milk. If you use a 1 inch screen everything will pass through. Even if you use a quarter inch screen you will get mostly coconut meat in your milk. You have to use a fine screen in order to separate the milk from the leftover. Our filters are off and the first thing God begins to do is correct our worldview, because if your worldview is off you will not understand God's reality. We need to learn to see things from His perspective. This is why I started this study by going back to an original problem. 2 Thessalonians 2:9-12 The coming of the lawless one will be in accordance with how Satan works. He will use all sorts of displays of power through signs and wonders that serve the lie, and all the ways that wickedness deceives those who are perishing. They perish because they refused to love the truth and so be saved. For this reason God sends them a powerful delusion so that they will believe the lie and so that all will be condemned who have not believed the truth but have delighted in wickedness. This has always been an interesting passage to me for a few different reasons. What is "the lie" that is talked about here in verse 9 and 11? What are the ways that "wickedness deceives those who are perishing" and how long has this been going on or does this only begin to happen at the coming of the lawless one? In what way does "the lie" cause those who do not believe the truth to "delight in wickedness"? The "Indigenous People's" (IPM) or "First Nations" movement is an unbiblical movement teaching heresies and doctrines of demons. It is being spread worldwide by YWAM, Don Richardson, John Dawson, Richard Twiss, Terry LeBlanc, Daniel Kikawa and many other adherents. The IPM or World Christian Gathering On Indigenous People is full of the false teachings of the Third Wave, New Apostolic Reformation (NAR), Word-Faith, Dominionism, Latter Rain and many other false theological systems. But it does have it's own distinctives that are driven by the works of Daniel Kikawa, Richard Twiss, and Don Richardson in particular. They are teaching Christians to "redeem" their cultures by worshipping their former gods, pretending they are YHWH. Go here for ordering information. Only $10. per DVD or $35. for the 4-DVD set, plus s/h. for US. There are a number of the leadership of the Emerging Church (EC) who do not believe that the Bible is the highest authority for the Christian faith. Most do not believe that the Bible is inerrant in the original manuscripts and many do not acknowledge that the Bible is our highest revelation. Yet this is a core doctrine over which true believers and false brethren must separate. Those who try to poke holes in Sola Scriptura make excuses like (1) we need to reinterpret the Bible through the lens of postmodern culture and religion (2) the Bible never uses the words "Sola Scriptura" therefore it is not a Biblical concept (3) there is new revelation for the church through the Holy Spirit apart from what is written and the precepts of the Bible and (4) the Bible just doesn't address our postmodern situation therefore we cannot rely on it for the truth and answers for our problems today. I will prove that all the above arguments, and more, from EC leaders and others is exactly what they are teaching. I will give you quotes from their teachings, videos and books. The postmodern church and its "movements" are abandoning Sola Scriptura in their rush to be like the Roman Catholic Church, which takes its authority from a mix of Scripture and tradition. "As a result the Church, to whom the transmission and interpretation of Revelation is entrusted, "does not derive her certainty about all revealed truths from the holy Scriptures alone. Both Scripture and Tradition must be accepted and honored with EQUAL sentiments of devotion and reverence." (Roman Catholic Catechism, Given October 11, 1992, the thirtieth anniversary of the opening of the Second Vatican Ecumenical Council, in the fourteenth year of my Pontificate. Page 31). Go here for ordering information. Only $10. per DVD plus s/h. for US. 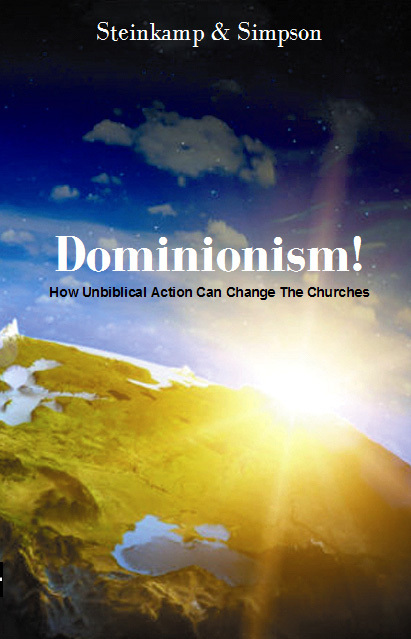 This DVD is a message based on this article: The Question Of Dominion. I am writing this article as an apologetic against the Third Wave, Latter Rain, Word of Faith and Reformed Theology teachings that the Church is to rise up and take over the systems of government, businesses and every other aspect of life. "See, the problem is, is that Satan has had too much of his way in our society because he has a government! And the only way to overthrow a government is with a government. It won't happen otherwise. So therefore the government of the church has to get into place in the extended church just like we do have it very well in place, we haven't reached our goal yet ..." (Transcript of C. Peter Wagner, Arise Prophetic Conference, Gateway Church, San Jose, CA, 10-10-2004) Wagner has substituted the "government of the church" for the coming government of Jesus Christ in the Millennial Kingdom. Wagner is "Kingdom Now" while the Bible teaches "Kingdom Come". What I wanted to do with this article is put the issue of dominion to rest by studying the definition the Bible gives to dominion and ruling authority. When we look at the subject we can easily ascertain what is going on today and what God requires of the Church. This DVD is a message based on the article: "Shepherd Or Hireling?" The Bible lays out the definitions of both an overseer (under shepherd) and a hireling. John 10:11-13 I am the good shepherd: the good shepherd giveth his life for the sheep. But he that is an hireling, and not the shepherd, whose own the sheep are not, seeth the wolf coming, and leaveth the sheep, and fleeth: and the wolf catcheth them, and scattereth the sheep. The hireling fleeth, because he is an hireling, and careth not for the sheep. (KJV) 1 Tim. 3:1-3 Here is a trustworthy saying: If anyone sets his heart on being an overseer, he desires a noble task. Now the overseer must be above reproach, the husband of but one wife, temperate, self-controlled, respectable, hospitable, able to teach, not given to drunkenness, not violent but gentle, not quarrelsome, not a lover of money. (NIV) Titus 1:7-13 Since an overseer is entrusted with God's work, he must be blameless, not overbearing, not quick-tempered, not given to drunkenness, not violent, not pursuing dishonest gain. Rather he must be hospitable, one who loves what is good, who is self-controlled, upright, holy and disciplined. He must hold firmly to the trustworthy message as it has been taught, so that he can encourage others by sound doctrine and refute those who oppose it. For there are many rebellious people, mere talkers and deceivers, especially those of the circumcision group. They must be silenced, because they are ruining whole households by teaching things they ought not to teach - and that for the sake of dishonest gain. Even one of their own prophets has said, "Cretans are always liars, evil brutes, lazy gluttons." This testimony is true. Therefore, rebuke them sharply, so that they will be sound in the faith. (NIV) A hireling does not really care about being a watchman, but is more concerned with protecting his reputation, position and income. A true watchman will guard the flock against wolves from within (Acts 20:30) and without (Acts 20:29) no matter the cost to his reputation, position or income. Following is a little quiz you can take to see if you are a true Biblical under shepherd as a leader in your church, are becoming a hireling, or are one now. Go here for ordering information. Only $10. plus s/h. for US. This DVD is a message based on these articles: Testing Music In The Church, Testing Music In The Church-Part 2, and Worship Song Ratings. Too many churches today are allowing music to be used in their services that is not glorifying to the Lord and can actually be a hindrance to the teaching of sound doctrine. Pastors and leaders should be using their leadership role to test what is being played and sung in their churches. Though some are quick to test preaching and teaching from their pulpits, many ignore the music being used in the same services. This is a tragic mistake. Music is a powerful medium. It is something that effects deeply the body, mind and emotions. It is a proven fact that music often stays with a person far longer than what is taught or preached. Songs roam around in our heads, especially if the melody appeals to us. What is often overlooked is the serious impression music makes on people, and the teaching they are getting over and over again as they allow the song to repeat in their minds and on their lips. Music teaches things much more subtly yet sometimes far more effectively. That's why the lyrical content of music in the church, as well as its effect on the spiritual lives of those who perform and listen, should be vigorously examined by the leaders of the church. This is a 2-DVD set. Go here for ordering information. Only $20. per 2-DVD set plus s/h. for US. Examine Yourselves & Hold On! This DVD is a message based on the articles "Examine Yourself To See If You Are In The Faith" and "Hold On!" 2 Cor. 13:5 Examine yourselves to see whether you are in the faith; test yourselves. Do you not realise that Christ Jesus is in you - unless, of course, you fail the test? People who call themselves followers of Christ or "Christians" and claim they are born again must believe certain things. If they do not then they fail the test of faith. They can claim they are born again all they want and "once saved, always saved" but if they fail the test of faith there is no eternal security. Only God knows who will be saved, from beginning to end, because of His foreknowledge and omniscience (Rom. 8:29, 1 Pet. 1:2). God did not make an arbitrary judgment about who would be saved and who would not. His Spirit is given to those He foreknew, when convicted of sin by His Holy Spirit, would choose to believe and commit themselves to Jesus Christ. We are not God and we do not have His omniscience. Therefore, according to Paul, we must be sure our belief system is in the right place once our eyes have been opened to the Truth. I am not saying we do not have assurance of salvation, but our assurance comes not only because of His Atonement and promises of salvation but from our continuing in the Faith, which is always the Biblical criteria. Those who would be Bible teachers must teach according to the whole counsel of God's Word. Let me be clear. There is only one way to salvation. That is by grace alone through faith alone in Christ alone. I will deal with a few of those issues following, but it is important to recognize that being saved is not just a matter of believing that Jesus lived, or that He was a man, or simply giving mental ascent to His existence in whatever form. I am going to go over an article I wrote back in 2006 in preparation for the book I wrote with Mike Oppenheimer called 'Idolatry in Their Hearts'. This book is an apologetic against the false teachings of the World Christian Gathering on Indigenous People movement, the Emerging Church and the New Apostolic Reformation which got their ideas from the book "Eternity in Their Hearts" by Don Richardson. At the time that book came out no one really saw the dangerous ideas Richardson was promoting. All they would have had to do was look at the two subtitles of that book to understand the implications. The first subtitle in the 1981 edition read: The Untold Story of Christianity among Folk Religions of Ancient People. Those who read this book found some interesting cross-cultural ideas but apparently missed the false premise of the book starting with the subtitle. How could Christianity be "among folk religions" where the Gospel had not been preached (Rom. 10:14-15)? At that time Christians who read the book were apparently satisfied that, though there was some questionable material present, it made for an interesting discussion on how to do cross-cultural ministry. 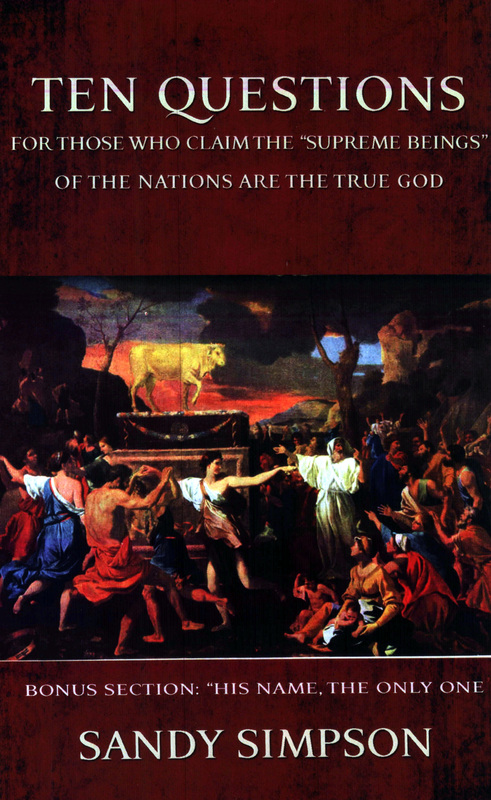 The subtitle it has today, which was first published in 1984, is as follows: Startling Evidence of Belief in the One True God in Hundreds of Cultures Throughout the World. This should have been a red flag for many Christians but then, who reads subtitles? But how could the "One True God" be known to Gentiles who did "not know God". I was talking with a pastor after a Wednesday night service and he mentioned that I said I had done an article comparing English Bible translations. He called me up later and asked me to come back and present the contents of that article I sent out in about 2002 to my mailing list for the Pacific Waves Newsletter which, unfortunately, I can no longer afford to publish and mail. However an archive of past issues of that newsletter can be found here. In that article I detailed a number of good and bad resources for pastors including Bible translations, concordances, commentaries, Bible dictionaries, etc. I present an edited version of part of that article on this DVD, particularly dealing with English Translations of the Bible. Translation is a very detailed endeavor and should only be undertaken by those with a proper education in that subject and a sound doctrinal background. I read a few books on that subject and it helped me understand the complexities involved. Hebrew is a rich language so it is hard to distill one Hebrew word down to one English word. Greek is a very technical language and it is also not easy to translate. This is why it is imperative to use the good English translations out there for comparison along with a good concordance and Bible dictionary. Kingdom Now or Kingdom Come? There are two kingdoms being taught in many churches today. Teaching about one of the kingdoms is on the decline while the other is being promoted all over the place. I am warning Christians that they need to check out who is using the word "kingdom", the books they have been reading and recommend on building "the kingdom", the people they have been hanging out with at conferences, and what they mean by "the kingdom". Go here for more information or click on the "Add To Cart" below. Only $10. plus s/h. for US. 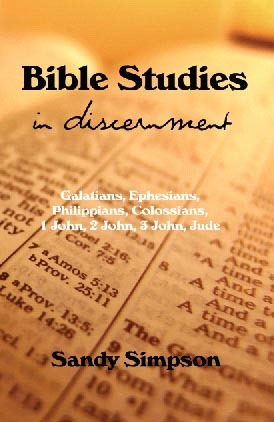 Bible studies in Galatians, Philippians, Ephesians, Colossians, 1 John, 2 John, 3 John and Jude with a focus on applying timeless discernment priciples to our modern times. Go here for more information or click on the "Add To Cart" below. The price is $18. per book plus s/h. Contains the PDF text to the book BIBLE STUDIES IN DISCERNMENT plus extra studies by Sandy & Juanita Simpson covering many issues of apologetics and discernment. Go here for more information or click on the "Add To Cart" below. The price is $10. per cd plus s/h. A Whole Lot Of Wishful Thinking These Days! This DVD series is a teaching based on this article. In this DVD series I want to detail a number of beliefs people have these days that have no basis in Scripture. I am going to roam all over the map, so to speak, and try to give fairly short answers on a number of topics and also give you useful links to articles that will help you deal with any particular issue. It is truly amazing how many false ideas people cling to without giving a thought to what the Bible has to say on the subject. Only $20. plus s/h. for US. Go here for ordering details. This 2-DVD series is a teaching based on this article. There are many signs of the great Apostasy, or falling away (2 Thes. 2:3) indicating we are living in the end times (Mt. 24: 3-14) I am going to go through some indications of the Apostasy in the churches as a follow up to the signs of the times in the world. This CD is a message based on this article. What's Up With Christian Bookstores? Go here for ordering details! The biggest promoter of false prophecies in cyberspace! This 2-DVD set is a message based on this article. 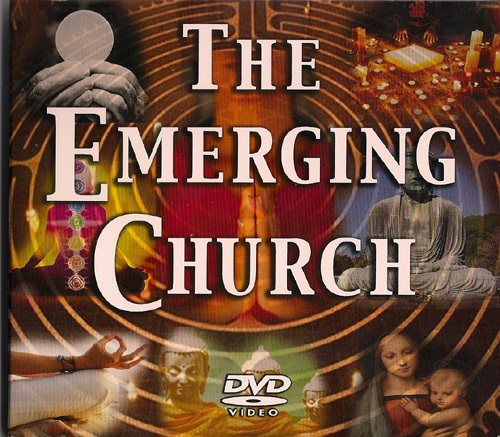 All the links to resources and articles we have on the Emerging Church on one CD. When you purchase the "Resource Tools - Emerging Church" CD for $10. plus s/h you will also receive a brand new free DVD called "The Emerging Church" that features Gary Gilley, Ray Yungen, Joanna Michaelson, Mike Oppenheimer and Sandy Simpson. The issue of the Emerging Church and it's introduction into many churches and mission organizations has reached a critical point. Many do not undersand what is being leavened into churches by the EC leadership. Many would be shocked to know their belief systems involve Universalism, New Age, defense of postmodernism, Interfaithism, and many other false doctrines. In order to reach out to this generation the EC leadership is proposing a whole new "map" to deal with what they perceive is a lack of understanding on the part of the churches on how to communicate. EC proponants believe the "scripture" for today is evolving and must change in order to reach postmoderns. Go here for ordering details on this 2-part DVD series! Does having eternity in your heart mean that you know God and are His child? Could Gentile cultures understand the Gospel from the stars? Did God create man's cultures? Has God always been in the process of redeeming cultures from the time of Babel by placing in them a true revelation of Himself? Is there the worship of YHWH in all cultures and religions through the names of supreme beings? Have all cultures always had a way to make things right between them and God? These questions and many more are answered in this book that addresses the false teachings of The New Apostolic Reformation regarding missiological methods as being carried out by many agencies including the World Christian Gathering on Indigenous People, YWAM, and many Bible societies. The New Apostolic Reformation - What is it and where is it going? by Bill Randles, Arnold Fruchtenbaum, Jacob Prasch, Mike Oppenheimer, Orrel Steinkamp, Gary Gilley, Dave Hunt, Sandy Simpson and others. This is a 6-DVD expose of the NAR and it's leadership of C. Peter Wagner, Cindy Jacobs, Chuck Peirce, Dutch Sheets, Bill Hamon, Jack Deere and others. Through the years I have been presented with many opportunities to forgive. Sometimes the situation was so severe that it took me some time to forgive and start the process of healing for myself, and eventually for others. I learned that a Christian needs to forgive other people even if they have not repented of their sins. That can be really hard if we let it be hard. But if we give our burdens over to the Lord, He will carry them and that frees us up to treat other people with love, compassion, and be in the right frame of mind and heart to set them up for reconciliation with Jesus Christ. That does not mean we tolerate their sin. We simply forgive them for what they have done to us, whether perceived or real, and move on to looking for ways to redeem them. We can then present to them the "truth in love" even when we have to rebuke them. was written to help believers to realize the absolute necessity of growing to maturity in Christ. Many churches are urging Christians to push aside discernment in favor of experience. It is our hope that this book will inspire many believers to fight the good fight, finish the race, and keep the faith (2 Tim. 4:7). is now available in book form. This is the DVD script plus commentary by Sandy Simpson. 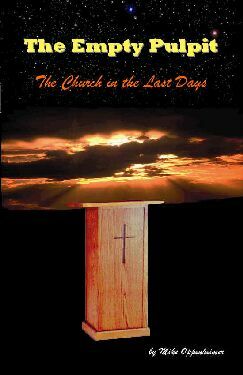 The commentary of the DVD series is not in the book, but there are many more quotes available than in the video series. Good reference material. Also available on CD-ROM. is a fitting manual for the Revelation Christian. All the precepts are in the seven letters in Revelation 1:9 - 3:22 to help us keep the faith, stay in sound doctrine, and reach out to those who are perishing. I hope and pray that this book will help the reader to be an "overcomer". Go here for more details and how to order! Want to be able to see your way through to clear biblical discernment? Want a set of tools that will allow you to disciple your loved ones so they will stand firm in the Faith? Want to sort out many of the false arguments and teachings that have invaded the churches? Then DISCERNMENT TOOLKIT book is for you! is taken from the book but includes a lot of footage of false teachers and false prophets. It covers the core doctrines, how we can use them to test, and examples on the DVD that can be paused for discussion. Also includes a teacher guide and links to resources on the web. This 3-DVD series is available now! SPIRIT OF TRUTH OR SPIRIT OF ERROR? features tons of video showing the teachings and prophecies of Benny Hinn. This is a proven tool to keep people away from heresy. What is Christianity? What significance does the cross have? Are there teachings that can wreck our faith? We live in an age unlike any other in the history of man. To follow the Lord among the unique challenges we must understand Scripture and live by it. Available for $20- includes shipping. Apologetics Coordination Team HIGHLY recommends this book. It deals with many crucial issues for the Church today. Go here to order the book by Mike Oppenheimer, Let Us Reason Ministries, P.O. Box 860683, Wahiawa, HI 96786. SEARCH our local pages, or search the World Wide Web with a few of our favorite search engines. You can search the ACT site alone from the What's New! page. Do the work. Be a Berean! Check out the NEW ACTTV Youtube Channel! New Google Search! Search all the best discernment sites with one search box. GoogleFree Safe Web Search and GoogleFree DITC Site search are both HERE. Do research on this CHRISTIAN SEARCH engine for Bible references, commentaries, dictionaries, and topical studies. To search the World Wide Web, try our TOOLS page. In order to understand where the modern fusion called “Dominioism” comes from, I want to first give you definitions of Kingdom Now, Dominionism and Reconstructionism. “Hard Dominioism” as it is called in the above definition, is what C. Peter Wagner (deceased) of the New Apostolic Reformation (a term he coined) have been advocating, following the teachings of the New Order of the Latter Rain and Reformed Theology “Reconstructionism”. Heb. 5:14 But solid food is for the MATURE, who by constant use have trained themselves to distinguish good from evil. At the core of maturity in Christ is the issue of training to be able to distinguish between good and evil, right and wrong. But in today’s churches this issue has not only been downplayed, but actually swept aside. I run a website and get hundreds of emails every week. Since the website deals with apologetics against false teachers and false prophets, about half the email I receive is blasting me for even bringing up the issue. These emails are from “Christians” who claim I am not “anointed”, don’t understand the work of the Holy Spirit, etc. I am forced to remind them of Hebrews 5 and Ephesians 4 and the biblical definition of maturity in Christ. Maturity is not defined as following dynamic speakers, running after people who claim the ability to perform signs and wonders, those with wealth, charismatic teachers with large numbers of followers, those with name recognition, and prophets who make wild prophecies. It is defined simply as training ourselves to know the difference between good and evil. Where do Christians get solid food? From voices in their heads, intuition, imaginations, flights of fancy, signs, wonders? No. Solid food is consumed by feeding on the meat of the written Word of God. In this article, I will detail some false ideas, especially from Johnson’s books. Have you eaten some bad fruit lately?